It’s party time, kids! This post provides you with the download links to all ten DJ mixes for GGP2, and will be updated with tracklists sometime in the coming days. Get your fluoro trance pants in the wash and start downloadin’! Each DJ’s mix is approximately 90 minutes in length and they average 225MB in size. The ID3 tags in the MP3s–as well as the file names–are such that they are easy to sort for proper listening order, and each is in high-quality 320k CBR format. 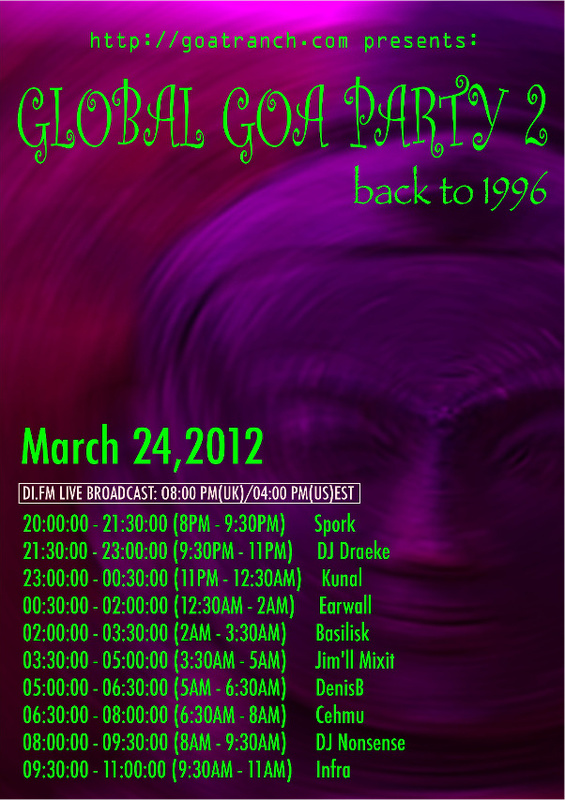 Don’t forget to tune in to DI.fm’s Goa/Psy channel at party time and join in the fun with the rest of the Ranchers! To convert to your local timezone, try the Worldclock Converter. New this year is real-time chat during the party! Wax poetic with your fellow Goa stompers while you’re resting your dancin’ feet. Hit #goa on DI.fm’s IRC server irc.di.fm using your favorite IRC client, or use the web client version at http://www.di.fm/chat — choose “goa” from the drop-down. Marsh, thanks for getting the links posted! I’ve snagged ’em, but I’m not going to listen until the broadcast by DI. It’ll feel more “authentic” that way—or something. Playlists will be posted sometime in the next week or so. Thanks for listening! Thanks Marsh, for an epic party. Collecting these mixes now; there is a wonderful synchronicity in how well some of these sets and track choices complement each other. Hard to believe that they were done independently. I eagerly await the tracklists! Thank you everyone for the BEST Goa experience I’ve had in years! I was truly blown away by the music all night. Thank you Marsh and thank you Di.fm, you were perfect hosts, again !! Marsh, you did it again. Of course, so did Spork, Draeke, Kunal, Earwall, Basilisk, Jim’ll, DenisB, Cehmu, Nonsense, and Infra! Pure classic insanity! I’ve listened to all the mixes at least twice now and I’m floored by the tales each one spins. There’s palpable ethos in each mix and taken together they weave an epic. These DJs have mixed with intricate precision exposing true artistic beauty. And what amazing tracks! The 1990s have never sounded better! I can’t wait for party number three! Where can we find the mixes? 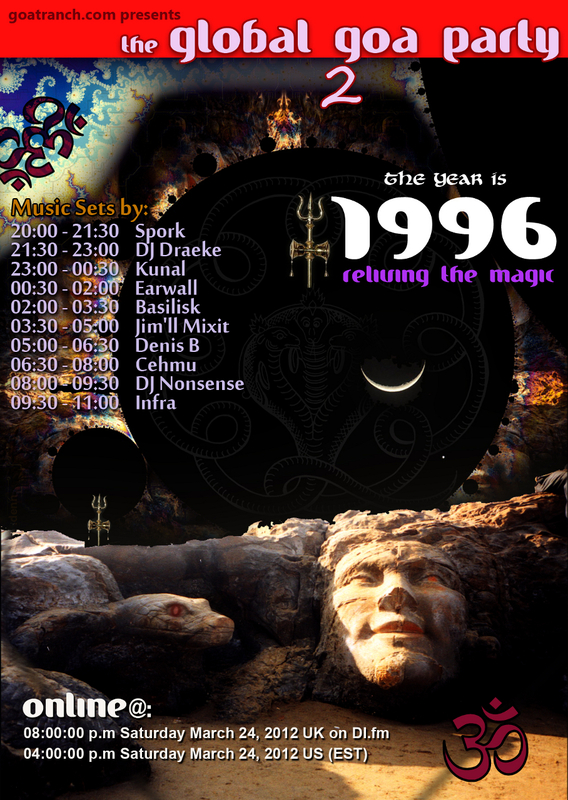 The set times above are active links to the MP3 files. Just right-click/save as… in each to download them. Because of ‘you people’ I’ve now dug deep into nonexistent savings to buy a long enough table, and re-arranged my pokey living room to accommodate my dex which have been in hibernation in a cupboard in the hallway for years. Now to find out if anyone still does replacement stylus…. @DP: This weekend I’ll finally be posting the tracklists, so sorry for the delay.